Monday, I received a review copy of Cruel Neccesity (Victory Point Games) which is the latest game in their much vaunted State of Siege game series. As I will shortly be on a big boat out of sight of land for FUN for the first time in my life for two weeks, I thought I’d take her out for a spin last night. 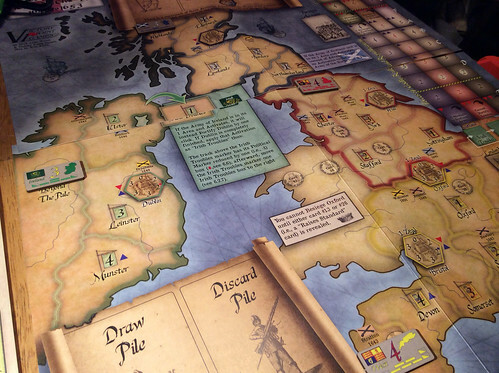 What follows is first impressions after one playing of the most basic scenario in the game, the First English Civil War. It is NOT a full up review, I will need to play it at least 4 more times (including the campaign) as I’m not clear on how every element works yet. I just thought I’d get some impressions down as I’ll be away from the internet for a bit. 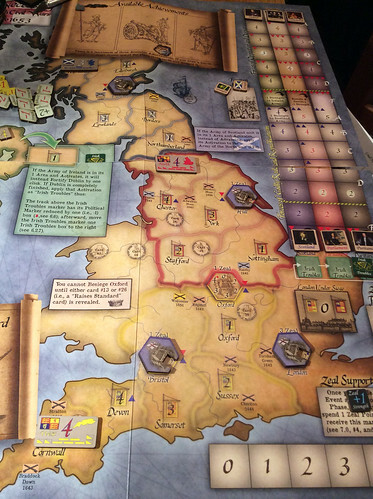 The game models the English Civil War in very broad brush strokes, using the “narrative building effect” of event cards divided into three sequential historical phases in a linked campaign, in a similar method to past State of Siege games (see my past review of Soviet Dawn). Also, as in past games, there is a Center point with four tracks that lead inward, along which markers for generic armies advance to threaten the center position (London, in this case). The overall effect is a game that isn’t a solitaire wargame, per se, but does possess some wargame elements. It certainly is a solitaire history game, and a very interesting one. I’ll admit something up front– State of Siege games have not had a lasting impact on me. I’ve bought them, enthused about them, I play them for a few times, and then they hit the shelves, not to come out for long periods. I don’t dislike the idea of a “story telling game” (their phrase for it) and was quite entertained by my past games, I just didn’t feel like playing it again after I’d run through the card deck a few times. It felt repetitive. With the the publication of Cruel Neccesity, maybe… just maybe, I’ve found a version of State of Siege that can stay fresh. For one thing, the graphic presentation has improved so much that this really looks like a historical wargame. Huge counters, giant maps, much better graphics and game aids all conspire to give the game a more natural map and terrain than previous map efforts. The component quality has greatly improved. Cruel Necessity is a part of Victory Point Games’ “Gold Banner” series of games, which means a box (of the heavy cardboard type), a slipcover, larger, better paper quality maps (sometimes bound!) and thick, chunky counters. Art on the map is well done. Instead of the typical square boxes on a track moving in to a central location, the map looks like a regular map of the British isles, divided into geographic areas, North, West, Middle, Ireland, kind of like Britannia. There are several fortified areas that represent castles of varying strength, which is depicted by putting a special counter with a notch cut into it that depicts the strength number changing as it moves around. The Army tokens that march along the track to threaten Parliment’s central position are also nicely done. This game comes with some logistical challenges– it takes up a ton of table space compared to its predecessors. Like other State of Siege games, cards create events that do a lot of things– mostly they move armies along the tracks, but they also represent historical battles. 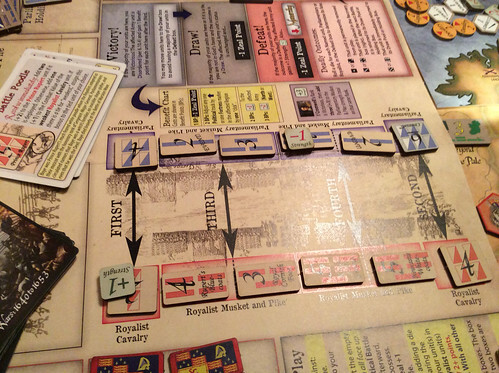 The card pictured above is the Historical Battle of Edgehill, very early in the war, which, very fittingly, was the first battle I fought in my first game playing the First English Civil War. The red cannon icon indicates a battle outcome that will be fought on the tactical battle display. The North and West Armies will also be advancing one space this turn. 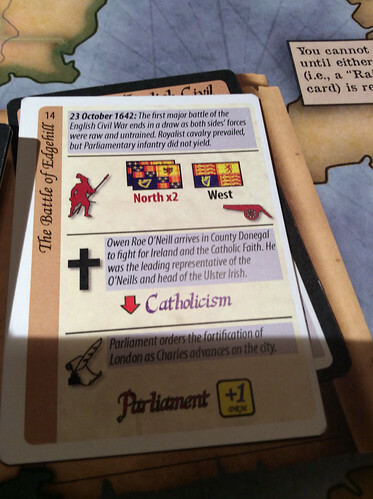 The other historical events (O’Neill and Fortifying London) will result in the Catholicism marker to advance one on its track and a +1 marker to be played on London. As you can see, cards do lots of things and have to be read very carefully. My first battle in my first game, The Battle of Edgehill, played on the side tactical board. A pretty grim defeat for Parliment. Even having Cromwell around didn’t help much since the die rolls were so uneven! By far, my favor new element of this game is the tactical battlefield. You have to maintain pools of troop markers face down for both sides of the conflict on an adjacent display. Then you pull out troops randomly (or pull from the smaller “named unit” piles), and place them on the battle display. Resolution is pretty easy– you roll a dice for each side and add the number to the total of troops in each sector of the battlefield. If you are over the other side by a certain amount of points, it’s a victory. If you are within one point, it’s a draw. The outcome of a battle is usually a plus or minus in “Zeal Points” which are the currency of the game, of sorts. There’s a lot of extra chrome tacked on the State of Siege engine in this game. For instance, there are slots for three achievements on the top of the map. Near as I can tell, these are the game tippers for the Parliamentary side, representing lasting political or social achievements. Achievement card are drawn from the events deck. If all vacant spots are used up, you can replace one that is already there, purchased with Zeal Points. Once bought, they give you a reward and add to your final VP score. I’ve only played it twice so far, and both times have been trounced, which is a good thing. I enjoy the extra chrome in this design.. the external battlefields, the sieges, the revolts and external elements really give this non-wargame a very historical, wargamey feel.